Clean and cut squids into round pieces and marinate it with chilli powder, turmeric powder and salt for 10-15 minutes. Crush ginger, garlic and green chillies and keep it aside. Fry the marinated squids in oil and keep it aside. In a large pan, heat oil and add sliced onions and saute till transparent. Add crushed paste (ginger, garlic and green chillies) and saute well. Add chopped tomatoes and mix well. Add garam masala, coriander leaves, mint leaves, yoghurt and salt and mix well. Add fried squids ,mix well and cook for few minutes in low flame. Remove the masala from flame and keep it aside. Wash and drain the rice. Boil water and keep it aside. Heat ghee in a wide thick bottomed pan, add cardamom, cinnamon, cloves and sliced onion and saute till transparent. Take a wide thick bottomed pan and apply some ghee. Layer the bottom of the pan with half of cooked rice. Add prepared squid masala over the rice and then add remaining rice as a top layer. Mix biriyani colour with little milk and sprinkle over rice. Sprinkle little garam masala and coriander leaves. Close with a tight lid and cook on low heat for 15-20 minutes. 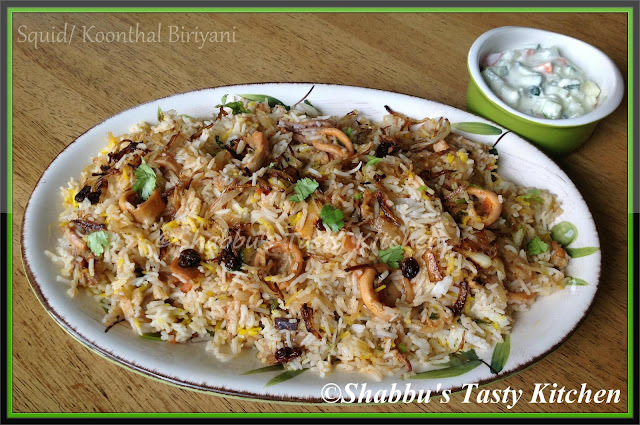 Garnish with fried onions, cashew nuts, raisins and coriander leaves...Serve hot..
Loving the biryani.. Looks so delicious. Drooling here. Haven't seen such a valuable recipe with squid..Amazing Shabbu.I am bookmarking..Thanks.